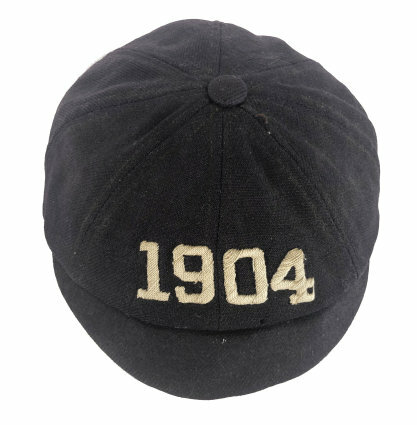 Lot #866 in Lelands' Winter 2015 Catalog Auction is a cap purported to be an 1870's Princeton football stocking cap. After studying the photo and description provided in the auction catalog, a number of questions have been raised about its authenticity. I've reached out to Lelands for additional information that may provide more certainty to prospective bidders but haven't received a response as of the date of this article. So in the meantime, I am providing my analysis, based on input from other experts, to help collectors come to their own conclusions about this piece. The earliest form of head covering used in football matches, stocking and skull caps were worn by football players between the mid-1870's and the early 1890's and had several purposes. With early teams wearing similar football jackets and pants, colored caps helped players identify teammates on the field. 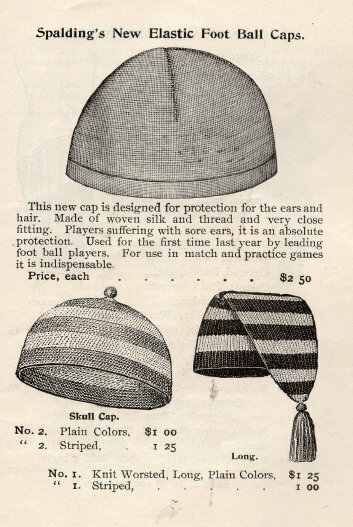 The caps also provided warmth and a minimal amount of head and ear protection for early players. The earliest known photos of football players wearing stocking caps date to around 1875, a period in which American football was transitioning from the kicking game (soccer) to a rougher rugby-style of play. 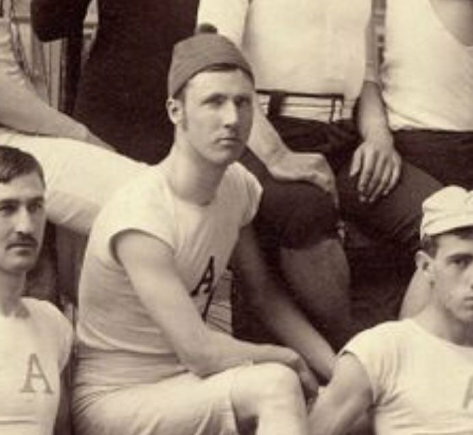 Between 1875 and the early 1880's the skull cap (right side of Spalding ad) was most prevalent in period photos. 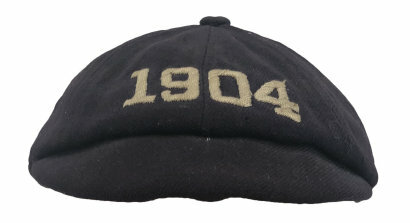 By the early 1880's, the stocking cap (left side of Spalding ad) replaced the skull cap as the head covering of choice. Lelands title and description of Lot #866 definitively attribute the stocking cap to Princeton University football. However, no provenance or compelling photo documentation has been provided to backup this claim. 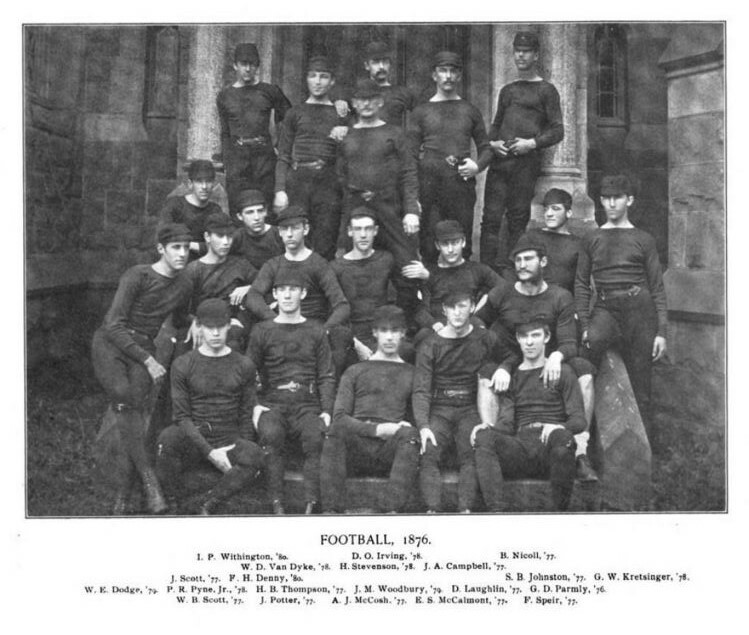 The photo provided in the print version of the catalog shows a photo of a Princeton football team wearing similar, but not identical caps. Without a chain of ownership from a Princeton player or a photo match, the authenticity of the cap comes down to a collector's reliance on two "facts," (1) that the cap's colors "WERE the Princeton colors" and (2) that the cap "passed with flying colors" after being "examined by several early football equipment aficionados." With a minimum bid of $2,000.00, bidders will be making a rather expensive judgment call on the authenticity of Lot #866. On December 15th and 21st, I emailed Kevin Bronson, Lelands' Special Consultant, several questions that could help provide more clarity to bidders on this item. As of the date of this article, I haven't received a response, but will update the article if and when I do. I am providing those questions and my analysis of the stocking cap below to help potential bidders with similar questions. I have been researching and collecting early football equipment for over 10 years as a hobby and passion. I started AntiqueFootball to share my research with others after becoming frustrated with a lack of available resources for collectors and the increasing frequency of inaccurate information provided in EBay and auction house listings. No one has bestowed upon me the title of "expert" or "aficionado," nor would I ever claim to know everything there is to know about football equipment. AntiqueFootball.com is my body of work to date, and I believe it demonstrates an advanced knowledge of the subject. I also consider myself unbiased (I don't derive any income from my site), objective (each of my articles is backed with historic documentation), and well-educated (let's face it, not many people spend their evenings and weekends researching this stuff). A football skull cap is one of the few remaining items on my personal want list. I do not and have not ever owned one. Few examples have ever surfaced and only a handful of collectors can boast of one in their collection. When possible, I have reached out to advanced collectors, historians, and textile experts for assistance with this article. 1. Do you have any provenance connecting this cap to Princeton? The online catalog calls it a "Princeton-style" but the hard copy calls it more definitively an "1870's Princeton Football Stocking Cap." I've been told that this stocking cap was acquired by an experienced dealer at a vintage clothing store. Can you provide any information on if this is correct, and if not, where the consignor did acquire it? I have consulted with a couple of football equipment experts and they believe that the shape is somewhat consistent with 1870's-1880's football caps, but without provenance or a physical inspection, and with only one photo it would be nearly impossible to confirm that it is. 3. Do you have any photos of a Princeton football player wearing a cap with the same weave pattern? The photo provided in your catalog doesn't match the cap pattern and I can't find the same pattern in any web-accessible Princeton team photos. I have reached out to the University for assistance checking their archives. After reaching out to several collectors and equipment dealers, one informed me that he had talked with the dealer who originally discovered Lot #866 and described him as "a long time dealer with a lot of experience with equipment," who "bought it at an antique market from a vintage clothing dealer." I have not received confirmation of this provenance from Lelands as of the date of this article. While some bidders may be comforted by the fact that it was found by an experienced dealer, the fact that it was found in an antique market should raise serious concerns with its Princeton provenance. The Lelands description provides no information connecting the cap to Princeton, other than the fact that its colors "WERE the Princeton colors." Princeton has used the colors orange and black since the 1860's, but the presence of this color combination on a knit cap is by no means a reliable indicator of an authentic Princeton skull cap. Good afternoon and I hope you're well. I would say it is very hard on these skull caps without credible provenance. From the photos in the auction, the stitching pattern looks similar to the caps I have acquired or held. With the stripe(s) at the base of the cap this would match 1875-1879 style. Only issue I would say is that I have only seen caps with one thick stripe at the base and not multiple stripes. Whenever multiple stripes are in caps they have gone top to bottom. This would be the case for early football and crew athletes. Does not discount it for a football cap, but I could not find an example through research of catalogs/books and athlete/team photos. I would say that the small flat ball at the top of the cap does resemble an 1870's skull cap in multiple examples of catalogs/books/ and photos. Similar to a bib front baseball jersey, unless you have an accompanying photo with the jersey or an definitive athlete record it is a gut call. I don't know if any of this is helpful, but let me know if you would like anymore perspective. 2. Is there anything about the cap that indicates it was specifically a football stocking cap instead of a rowing or winter cap? Princeton's football teams were perhaps the most celebrated and photographed teams of the final quarter of the nineteenth century, so a photo match of Lot #866 should be easy to find. However, the image included with Lelands' catalog doesn't match weave pattern of Lot #866. 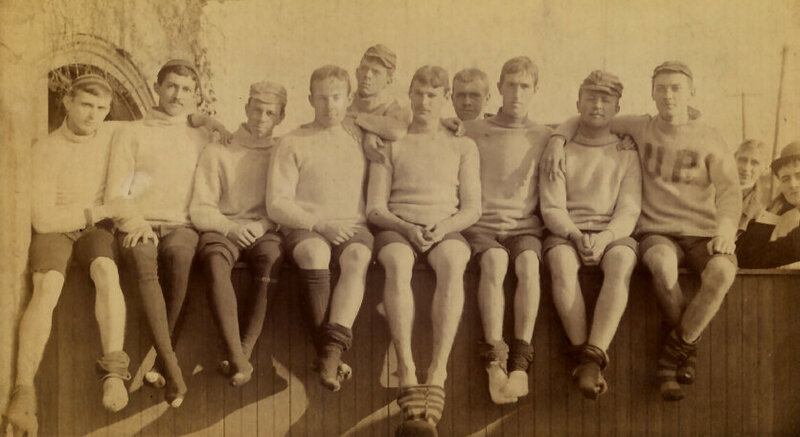 In the earliest team photo in which players wore caps, the 1876 Princeton football team is shown wearing solid colored caps with short visors. In his email, Dan mentioned crew. 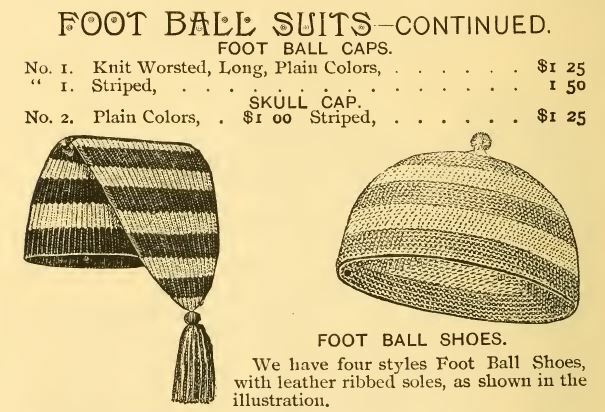 After researching period photos and catalogs, I learned that knit skull caps were worn not only by football players but by crew (rowing) athletes, skaters, and polo (hockey) players in the late 1800's and early 1900's. If Lot #866 was discovered in an antiques market without provenance, it would be nearly impossible to definitively and conclusively identify it as a skull cap used in the game of football. 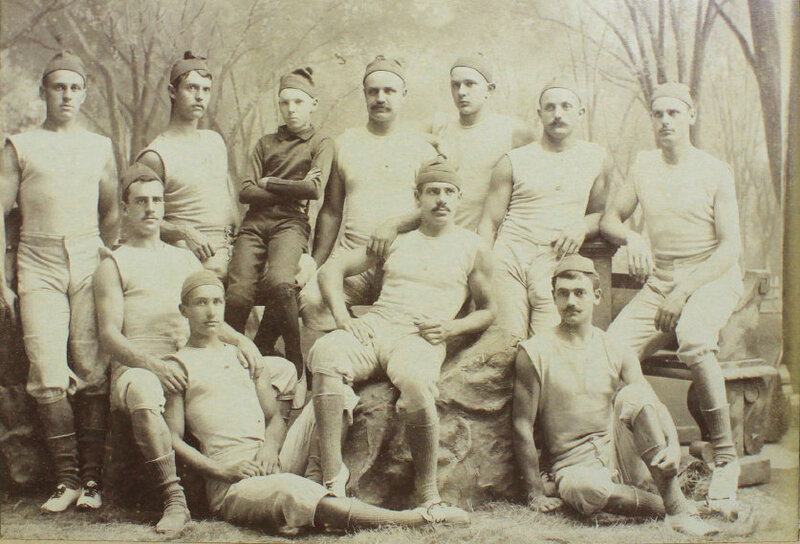 The 1877 Princeton football team was also photographed wearing solid colored caps with visors.